I'm sad to report that Herb Grasse passed away August 24, 2010, he was 65 years old. Few people have been able to successfully navigate the strenuous demands of America's highly competitive automobile industry while still producing artistic, visionary and imaginative automotive designs. The gregarious Herb Grasse was such a man. His automotive and transportation design career began in 1968 following his graduation from the world-renowned Art Center College of Design in California. Over the next 40 years, Herb mastered not only the creative aspects of automobile design, but the nuts-and-bolts business acumen necessary to make his designs a reality. Herb lent his talents to the giants of the industry including Chrysler where he worked on the original Dodge Challenger and Ford Motor Company where he worked on the XD Ford Falcon, the original Ford Laser and the Ford Telstar. Each success was rewarded with more demanding assignments including a twelve-year overseas stint as principal designer of exteriors for Ford Motor Company Asia-Pacific and as chief designer for Nissan Australia. In addition to his commercial automotive design career, Herb applied his creativity to the more fanciful design of custom and show cars including work on the "Batmobile" for George Barris, the Spice Girls Cadillac and the Waltzing Matilda Jet Truck (which held the land speed record for trucks in Australia). Herb also worked closely on dozens of other projects for the United States military, various movie studios and concept-car entrepreneurs. Herb's pinnacle achievement, however, was the design of the Bricklin SV1 automobile in the mid-1970's. Working closely with Malcolm Bricklin as his director of design, Herb breathed life into the concept, design and manufacture of this dynamic, forward-looking sports car. From creating rough sketches, to clay models, to business considerations, to the production line, Herb was involved in every aspect of making this dream car a reality. His singular efforts were recognized by his being named the Industrial Designer of the Year in Product Design by Industrial Design magazine and recognition by his alma mater, the Society of Art Center Alumni with their "Orange Door" award for Best Transportation Design. When Herb retired from the commercial automotive industry in 1990, he started his consulting firm, Herb Grasse Designs, where he was involved in many other automotive design projects. Also, capitalizing on his years of design work and modeling of concept cars, he fabricated highly detailed architectural scale models for up-scale homes and businesses for architects in Arizona and across the country. And, as a purely creative outlet, Herb produced dozens of beautiful fine art paintings. Herb approached his business like he did his life…a solid mixture of sometimes flamboyant fun, creativity and passion, yet always tempered with a clear-headed dose of reality. It was Pancreatic Cancer that finally claimed his life at 65. He is survived by his wife Terrie, a son and three grandchildren. If you would like to share a personal memory about your own involvement with Herb, please share it with Terrie at the address below. Your remembrances will be assembled into a lasting record for his family. In lieu of flowers, you may wish to contribute to a fund to help defray Herb's medical expenses by contacting Terrie Grasse, P.O. Box 25361, Scottsdale, AZ 85255. I had the pleasure of getting to know Herb Grasse in October of 2007. 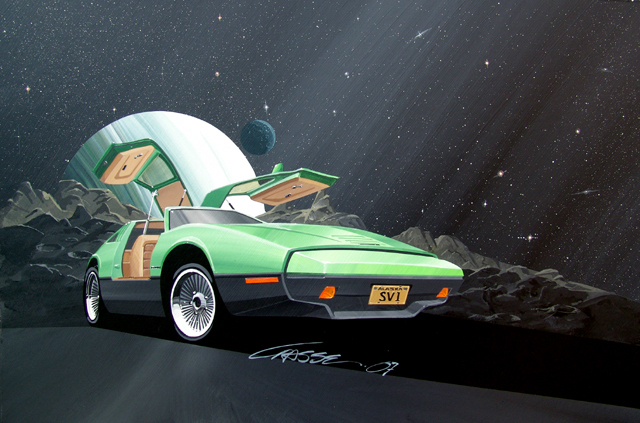 I contacted him because I was very interested in the many beautiful acrylic paintings of the Bricklin SV-1 he had created and I wanted him to make a painting of my Bricklin. 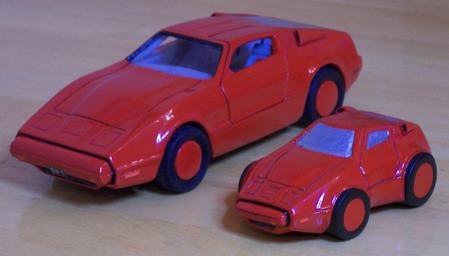 Turns out, he was interested in having one of my Bricklin models customized to look like his personal car, so we agreed on a barter. In the process of building his model, we had many long phone conversations that invariably drifted other directions and it was fun hearing some of the inside stories about the development of the Bricklin. I could tell he was very fond of Malcolm and enjoyed sharing stories of him. He told me that since Malcolm was Jewish, he started referring to the car he was developing as the `Kosher Coupe.' Apparently Malcolm didn't like it, but that just egged Herb on even more. He then started referring to the SV-1 as the `Yom Kippur Clipper.' I don't know if Mr. Bricklin liked that any better, but it's just a peak at the light hearted, playful spirit that Herb seemed to posess that I enjoyed when getting to know him. Pictured below are the model - and the Baby Brick - I created for him. He didn't know the Baby Brick was coming - I sprung that on him as a surprise. He told me he barely had a chance to see the Baby Brick before Terrie snatched it from his hands and ran off with it saying, `it's so cute!' His model features a custom hatchback, custom covers over the rear-quarter windows, custom seats, a custom console mounted between the seats and another custom console suspended from the headliner. The interior and exterior colors are unique, as well. Herb Grasse did outstanding work. This is a photo of the painting he did for me. It's now proudly displayed in my home. If you look carefully, you can see that he included an Alaska `SV-1' license plate on it so there's no mistaking this painting for anything other than vin #1864!! Thank you, Herb. I will treasure this forever. You can see more of Herb's work at his website http://www.herbgrassedesign.com.